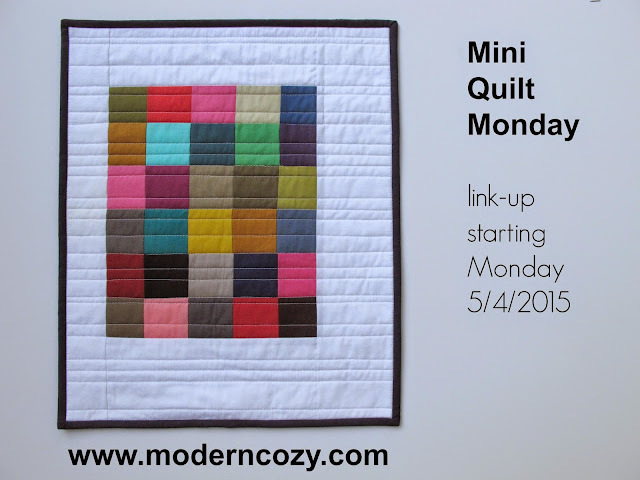 Modern Cozy: Mini Quilt Monday :: Color Blocks and a Giveaway! 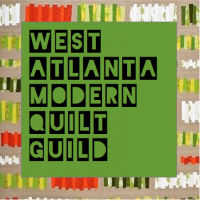 Mini Quilt Monday :: Color Blocks and a Giveaway! Welcome to another Mini Quilt Monday! This week I have this mini inspired by Denyse Schmidt's Big Charming pattern - I guess this is a Little Charming - teehee. I used 2.5" squares and just placed the colors randomly. White borders and a little straight line stitching complete this mini. It measures 15.5"x19" and is bound in Navy Kona which is quickly becoming a new favorite neutral of mine. The best part about this mini? You could win it! I'm starting a Mini Quilt Monday link-up next Monday 5/4/15 and I'd love some help getting the word out. It seems like there are SO many good mini swaps going on and it would be nice to have one place to see them ALL. I also hear from people all the time that aren't on Instagram that like seeing mini's too. So I'm giving this mini away as a thank you for helping me spread the word to start sharing your mini quilts (pillows, mug rugs - I'm happy to have all the small pretties) right here starting next Monday! Share this info somewhere, anywhere (on your blog, IG, twitter, fb - really anywhere) and let me know that you did right here in the comments and you'll be entered to win. I'll announce the winner next Monday. Thanks for the help and looking forward to seeing you back here next week! I shared it on FB. Great idea, I will include your news in my next post - I 'Pinned' it for now! Hi, love the mini and would love to show it off to everyone that comes into my home. I put the word out on Google+. Thanks for achance and have a great day. That looks like a great way to use up all the small pieces of fabric I have saved throughout the years. I never like throwing things away!! I shared on fb. Your quilt is delightful! I shared this on Facebook. Thanks for the awesome giveaway!